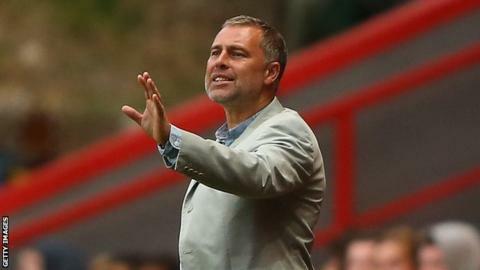 Dagenham & Redbridge manager Wayne Burnett believes their form will pick up once his summer recruits settle. The Daggers have taken two points from their first five games of the League Two campaign and are 23rd in the table. "It is a constant rebuilding process for clubs at this level and it's tough because you don't get any continuity," Burnett told BBC London 94.9. "Sometimes it takes a while for new players to come into a group and for cohesion to take place." "We lost four or five key players and are having to recruit players to fit into our team and how we do things," the 44-year-old said. "When players come in they have to learn very quickly and it has probably taken us a bit longer than anticipated. "We probably missed out on 15 players because of financial reasons. We have to wait and try and get the best value for money." The Daggers have already played three of the division's early pace-setters in Leyton Orient, Wycombe and Portsmouth, and Burnett has been encouraged by recent performances. "We have started to pick up a bit and look a bit more solid in our play. I feel we are getting there and are not too far away," he added. "Sometimes it takes a little while. We need to pick up points quickly because we don't want to be cut adrift."